“Daniel” (not his real name), an undocumented teenager, was arrested in a Montreal-area school in October 2014 and turned over to border police. He was detained for a week at the Laval Immigration Detention Centre before being deported all alone to Mexico at the age of 17. He was separated from his family, who lives in Montreal. An unaccompanied minor, he is currently living in great insecurity in Mexico City. The situation is urgent. Solidarity Across Borders denounces this border violence and specifically the deportation of a minor alone, the forced separation of a family, and the complicity of SPVM and CBSA in making schools unsafe for children. In response, Solidarity Across Borders, the Collectif éducation sans frontières and other community organizations have launched a solidarity campaign to bring Daniel home and regularize the status of his family in Canada. See below to see how you can show your solidarity with this non-status family right now. Daniel arrived in Montreal with his mother when he was ten. When the family’s refugee application was refused, his mother made the difficult decision to remain in Canada without papers to protect her children. Thus, when he was 12 years old, Daniel joined the ranks of the half a million undocumented people living in Canada. Like all people in his situation, including the rest of his family, he was under an arrest warrant for failing to show up for deportation. This meant that any time the police intercepted him, even for crossing the road on a red, he was at risk of arrest and deportation. It happened on his 17th birthday, when Daniel was visiting friends at his former high school. School staff are suspected of having reported the undocumented teenager. He was arrested, handed over to border police and, after a week in detention, deported by himself to Mexico. The Commission des droits humains et droits de la jeunesse du Québec is currently investigating the role played by the school in his arrest. It is absolutely unacceptable that the SPVM and CBSA colluded in this way to make schools unsafe places for our children. Before Daniel was deported, the family submitted an application for permanent residence on humanitarian and compassionate grounds (H&C). If the government accepts the application, Daniel’s family will receive permanent residence and he will be able to return home. On 23 March, a public campaign Bring Daniel Home was launched at a press conference at UQAM. 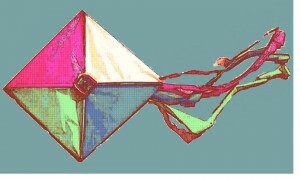 The symbol of the campaign is a kite which Daniel used to cover his face in a moving video message to the media. The next event is a Mothers against Borders Picnic Fundraiser on Mother’s Day (10 May at 1pm, Jarry Park). Details will be sent soon. 1. Between now and 1 May, please write letters asking the government to urgently accept this family’s file. Send a scanned, signed copy to Solidarity Across Borders (solidaritesansfrontieres@gmail.com) so we can add your letter to the family’s application for permanent residence. 2. Please donate: donations will cover campaign expences and directly support Daniel, who is currently living in extreme precarity in Mexico City. Cash: contact solidaritesansfrontieres@gmail.com to make arrangements. Cheques: make your cheque out to “Solidarité sans frontières” and put “Daniel” in the memo line. Mail to Solidarity Across Borders-QPIRG Concordia, 1500 de Maisonneuve Ouest, #204, Montreal, QC H3G 1N1. 3. Mark your calendars: 10 May Mothers Against Borders Fundraising Picnic (10 May @ 1pm, Jarry Park) and pass the word when the announcement is sent. END the violence of deportation! No one is illegal! Access for ALL!